Goal sometimes feel so….cumbersome! Yet they are crazy-necessary if you intend to manifest any sort of business success or achieve overall enhanced well-being in life. Books are great, but I seem to lose interest pretty quickly. My office is littered with half-finished books that I know I will get back to (someday). Coaches are great too….but expensive. I’d LOVE to have someone virtually kicking my fanny and keeping me on track but it’s just not in the budget. Courses and classes…ah yes. This is where I shine. I LOVE courses, classes and things that guide me along on a predetermined path. I listen to courses and classes while I walk in the morning or in the afternoon when my client work is caught up for the day. There are some dandy ones, and some stinkers too. BUT, I’ve been blessed enough to find several this year that have been affordable and also exactly what I’ve been needing. Wouldn’tcha know, I found anudder course this week that I am crushing on and that I’m excited to introduce you. It’s one that I know that will give you hope. Crystal Paine is someone that I have followed for years and let me tell you–this mama puts out GOOD information. Her brand spankin’ new course is an easy and efficient, step-by-step plan on grabbing this year by the short hairs and it’s done in such a way that you don’t feel like you’re just spinning like a cat on ice and getting nowhere! Crystal Paine is the founder of MoneySavingMom.com and she’s created the Make Over Your Year course to help peeps like you take your big dreams and ideas and turn them into realistic goals and a doable action plan. Crystal and hubby, Jesse, created this AMAZING 4-week course that takes a unique three-fold approach. Each week you will have a chapter to read, a video to watch, and worksheets and projects to complete. A small investment of time each week can yield potentially amazing results for yourself and your family. Another HUGE “plus” for me was the price! The whole kit-n-kaboodle is only $29. TWENTY-NINE bucks! I know people who spend more than that on lattes in a week! 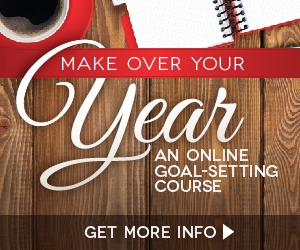 SO….Head on over to MakeOverYourYear.com and get in on the rock-bottom price for this fabulous course today! Make Over Your Year will teach you all these skills and some much more. PLUS, there’s a Flash Sale going on so you can purchase Make Over Your Year for just $25. But hurry this special price is only available until Monday, March 21st. We may be looking at the fourth month of the New Year, but NOW is the time to take charge, invest in yourself and start making your dreams come true. 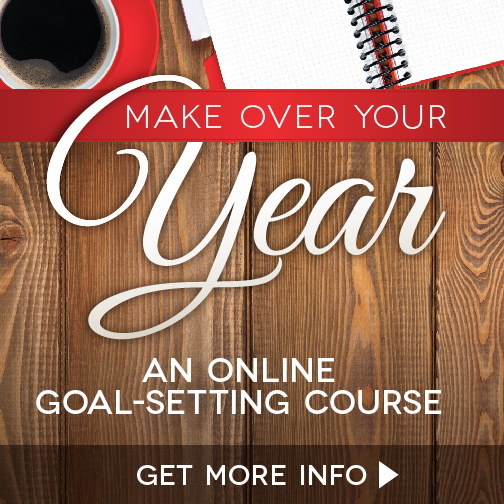 Make Over Your Year will give you the tools you need to get the ball rolling in the right direction. Make over your year looks like it will be a very good course at a very affordable price! Setting goals is the best ways to make all our dreams and plans come true. Next Post I may have tinkled a little….